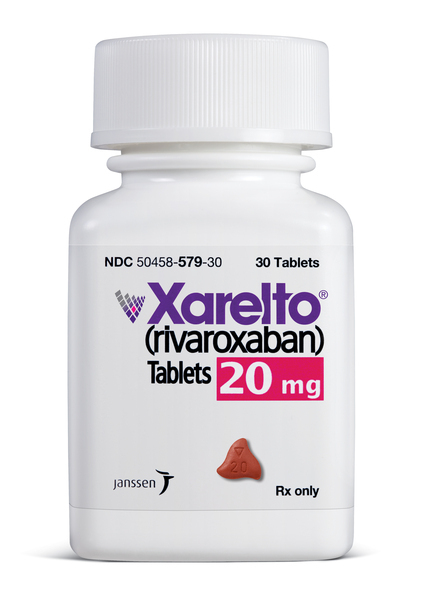 Xarelto (rivaroxaban) is a blood thinner that prevents the formation of blood clots in patients with non-valvular atrial fibrillation. Medical professionals may prescribe the anticoagulant to reduce the risk of stroke in a patient with non-valvular atrial fibrillation, reduce the risk of deep vein thrombosis or pulmonary embolism, or prevent deep vein thrombosis following knee or hip replacement surgery. However, a number of serious Xarelto side effects have been reported in recent years – including, but not limited to, life-threatening bleeding episodes. Xarelto is part of a “new class” of drugs that includes Pradaxa and Eliquis that have been heavily marketed as better alternatives to Coumadin (warfarin) because they do not require frequent dose monitoring, blood tests, or dietary restrictions. Since gaining FDA approval in 2011, manufacturer Bayer and marketer Janssen Pharmaceuticals have sold more than 1.4 million prescriptions world-wide. The ROCKET AF Trial found that the most frequent adverse reaction associated with discontinuing Xarelto were bleeding events. The incidence rate was 4.3% for Xarelto, compared to 3.1% for warfarin. A watchdog group, The Institute for Safe Medicine Practices, reported that more than 350 instances of “serious, disabling or fatal injuries” involving Xarelto have been formally submitted to the U.S. Food & Drug Administration, and that Xarelto was the 10th “most frequent suspect drug in serious or fatal adverse events in 2012.” Last year, they found that the number of serious adverse events linked to Xarelto have overtaken those for Pradaxa – a comparable drug, which is in the midst of $650 million settlement talks to resolve about 4,000 lawsuits alleging serious bleeding events. While the risk may be known, what was not clear for a long time was that there was no antidote should uncontrolled bleeding occur. By comparison, the manufacturers of Coumadin have counseled medical providers on a suggested remedy to reverse the effects of their drug, should bleeding occur. Who is at risk for Xarelto bleeding? Though rare, some Xarelto users have required emergency care for coughing up blood, dizziness, weakness, sudden loss of movement in a limb, yellowing of the skin, painful or swollen wounds, discolored urine, black tarry stools, and/or irregular heartbeat. Discontinuing Xarelto in patients with non-valvular atrial fibrillation increases the risk of stroke. Patients treated with Xarelto while receiving epidurals or spinal taps have suffered long-term paralysis. Antifungal, HIV and seizure medications have all been known to interact with Xarelto. Who should be most concerned about Xarelto side effects? Women who are pregnant, nursing, or trying to conceive should not take Xarelto because its effects have not been studied on this population, and this medicine could cause bleeding complications during labor. Should patients stop taking Xarelto? Patients who have experienced serious complications because of internal bleeding following Xarelto use, or who have lost a loved one due to Xarelto side effects, are consulting Xarelto lawyers to determine if they are eligible to seek financial compensation via product liability litigation.